Radiating serpentine self-absorption, Philip Seymour Hoffman embodies a youthful Truman Capote. 98 min. Sony Pictures Classics. Director: Bennett Miller. Cast: Philip Seymour Hoffman, Catherine Keener, Clifton Collins Jr, Chris Cooper, Bruce Greenwood. Radiating serpentine self-absorption, Philip Seymour Hoffman embodies a youthful Truman Capote in a new film focused on the author-raconteur's pivotal years. The film is called simply Capote, and its nuanced portrait, in Hoffman's craftsmanlike hands, displays all of the shades of its subject, a man of conflicting, complicated impulses. Screenwriter Dan Futterman and director Bennett Miller ably share Hoffman's task of penetrating the motivations behind the man who popularized the true-crime genre with the bestseller In Cold Blood (an incipient non-fiction novel), then never again delivered a major work. In the process, the creative team makes the convincing case that Capote exploited not only his subjects—killers Richard Hickock and Perry Smith (Mark Pellegrino and Clifton Collins Jr.)—but anyone in a position to enable his work. That work entailed four years of research, writing, and obsession. 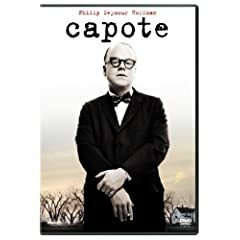 Capote sometimes appears to sincerely expose his own hurt to ingratiate himself in the Kansan community so removed from his New York haunting grounds, but the filmmakers suggest that Capote's gestures were never more than self-serving (though perhaps guiltily so). In a farmhouse interview, the effete Capote opens up to a witness—"People always think they have me pegged, because of the way I talk. They're always wrong, you know what I mean? "—but, true though the confession may be, it's the means to the reporter's end. Capote ruthlessly wrangles unlimited visitation to Death Row, where he plies Smith and dangles promises of legal help, some of which go unfulfilled. The writer feels a kinship with Smith that borders on the sexual, and the more time he spends with Smith, the more frustrated and noncommitally self-critical Capote becomes. True to form, Capote's greater concern remains his work. "All I want to do is write the ending," he says, "and there's no end in sight." Clad in a Burberry overcoat with a feminine cut, Capote gives off an alien quality even in New York, where he reliably forms a vortex of attention at every party and publisher (Bob Balaban plays William Shawn, the New Yorker editor who greenlit Capote's story idea). Catherine Keener, as Capote's friend and professional companion Harper Lee, enables the viewer to gain greater perspective on Capote's tricks of the trade. Calling him on his worst behavior, Lee gradually recognizes that Capote takes, but cannot truly give. Hoffman also gets fine support from Chris Cooper as the local lawman, and Collins, proving he has more to offer than Hollywood ever noticed. All provide further evidence that the film's greatest strength is its restrained tone, set by Miller's measured and sensitive direction. 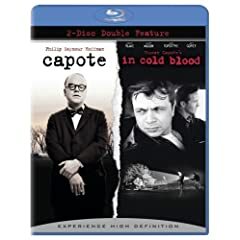 Sony's fully-loaded Blu-ray special edition of Capote shares real estate with the next-gen debut of In Cold Blood, each film being the ultimate bonus feature for the other. Both films look great, though the gorgeous black-and-white transfer of In Cold Blood is revelatory. Capote has some minor flaws (edge enhancement, a bit of noise); generally, though, the transfer makes the impression of film over video, capturing the rich but shadowy color scheme. The Dolby TrueHD 5.1 surround tracks can be considered definitive. You'll also find two screen-specific commentaries, both with director Bennett Miller. Miller shares the first with his star, Philip Seymour Hoffman (who ended up winning the Best Actor Oscar for his work), and Miller and cinematographer Adam Kimmel chat on the second track. Three featurettes (with a helpful "Play All" option) offer behind-the-scenes glimpses. The first, "Truman Capote: Answered Prayers" (17:13), takes a quick look at the real Capote, as seen by biographer and acquaintance Gerald Clarke, Miller, Hoffman, Kimmel, and screenwriter Dan Futterman. "Making Capote: concept to script" (17:13) talks to all of the above and adds producers Caroline Baron and William Vince, as well as actors Catherine Keener, Chris Cooper, and Clifton Collins, Jr. (despite the implication of the title, this featurette only partly deals with script development and gives more attention to casting and character insight). The third and final featurette is "Making Capote: defining a style" (18:24), which indeed focuses on the look of the film. New interviewees include production designer Jess Gonchor, costume designer Kasia Walicka-Maimone, and editor Christopher Tellefsen. Devotees of one of 2005's most notable films will find much of interest in the special features, including Miller's recounting of how Hoffman resisted any display of emotion in the "final goodbye" scene—until he was before the camera and found the truth of the moment. The dedication the crew showed on this low-budget production is likewise evident in the tales of scouting and rebuilding the home seen in the film's first scene and the lengths to which Kimmel and Miller would go to get atmospheric second-unit shots. Perhaps most importantly, the Blu-ray and mirrored DVD offer an opportunity to study Hoffman's award-winning work. All site content © 2000-2019 Peter Canavese. Page generated at 04/18/2019 01:48:41AM.